Hispanic Heritage Celebration started by our student Gabrielle Megan singing USA National Anthem, followed by Las Americas Hispanic Anthem played on video. 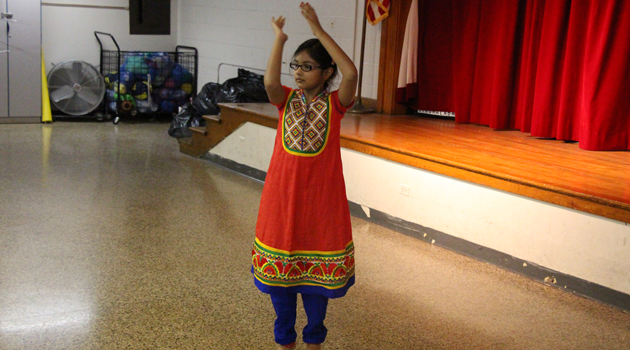 Our student Ervanur Gidrislioglu spoke about Hispanic Heritage Culture and its importance in our school, and community. Latin Art School Projects was presentted by Rodrigo Espinal. Hispanic Song perform representing Chile: No puedo olvidarlo por Anyssa EspinalVenezuela dance performrd Cumbia: Oye traicionera por, Nathaly Garcia, Juan Ortega, Edwin Perez, Pedro Peguero, Haydee Montecinos y Demiana Denho, Ivanna Valdivia and Jeschelle Manansala.Argentina dance perform: Tango por Edwin Perez and Anyssa Espinal.Spain dance perform Sevillana por Demiana Denho and Jeschelle Manansala.Also trio from choir class Anyssa Espinal, Gabrielle Megan, and Edwin Perez sung La Musica song with Mr. Hyseni on keyboard. Guitar class, Julia Coulter, Bedoya Juan, Esquivel Juan, and Karaback Kerim performed a Spanish theme, as well as blues. Students, teachers, staff, and parents enjoyed this wonderful performance. Our student Shai Rodriguez performed a Spanish tune in duet with Mr. Hyseni. Thank you Ms. Quiroz for preperaing and making this celbration unique, thank you Mrs. Rodriguez-Art teacher for selecting and exposing our students art work, and thank you Mr. Hyseni for wonderful music with choir, and guitar class.